'Carpe Diem'; Latin for 'Seize the day'. Most folks would translate this as meaning that they should live each day to the full. For me, I take it as meaning that I should blow cash that I don't have on extravagant holidays that I simply cannot afford. Last year, it was New York (sponsored by Mastercard) and just a couple of weeks ago, it was Florida (sponsored by Santander and their 2.3% mortgage rate). I figured that putting a 'once-in-a-lifetime-holiday-that-my gorgeous-children-will-NEVER-forget' on my house was a fabulous idea. I can pay it off in teeny installements over the next 25 years and should I drop dead in the meantime, my 'gorgeous-but-now- hairy-adult-children-with excellent jobs-thanks- to-their- mother -nagging -them -to -do -their- homework' will be left to foot the bill whilst I sleep soundly for eternity in my coffin. So here is what went down when we brought our beloved kids to the land of dreams; where rollercoasters soar high into the sun-filled skies and where doughnuts the size of human heads fill the shelves of every corner shop. Of course, we all know that kids are emotionally volatile and a few tears on holiday are to be expected. When 6 year old Bob spilt a full can of Sprite down himself on the plane, he naturally wept a river of tears. But he soon solved the problem by deciding to strip down to his pants and was then profoundly joyful spending the remainder of the 9 hour flight flashing his Spiderman Y-Fronts to the British Airways staff and passengers. I, on the other hand, was crying a river inside. When my 8 year old Stan discovered that he had to queue for 65 minutes in Universal Studios just to sit on the pink plastic horse with googly eyes, many tears were shed. Queuing in 30 degree heat is indeed frustrating and so this outburst was understandable. Luckily, we discovered that such tears of frustration can be easily mopped up with an entire can of Pringles and a kilo of Haribo whilst in the queue. Salty snacks eliminate salty tears....they should write this on the packaging to boost sales. But the person to win the prize for being the biggest cry baby, if you can believe it, was me. No one can ever prepare you for how it feels to stand at the entrance of the glorious castle in Disney's Magic Kingdom watching the Princesses dance out one by one. Your entire childhood is laid out before your eyes and once you see it up close, it is DEVASTATING! ; devastating, because it is only in that exact moment that you realise that Walt Disney was a massive, lying jackass!! No Walt, I didn't grow up to become the beautiful Princess that you made me believe I would be. I was reminded of this right then. Princesses don't have hair that blows up into a formidable afro in humid conditions. They don't have pot bellies or leg hair that grows back an hour after shaving. They don't wear fanny packs and elasticated waist shorts from Asda. You lied to me, Walt. My dreams didn't come true. And this was very upsetting. And my Prince Charming? Well, Walt, he is not quite what you made out that he would be either. the fact that my kids are wimps!! Yes, it was only after I'd forked out £5,000 and travelled to the other side of the world that I learnt that my formerly fearless kids are absolutely terrified of roller coasters/ heights/ water/the dark and all fast moving vehicles. And considering that the very essence of this holiday was for them to experience the thrill of roller coasters/ heights/ water/ the dark and many fast moving vehicles, I was left with no choice. I had to join Walt and lie. "Not at all", I replied joyfully as I strapped him into the seat of the deathly 'Dudley Do-right's Ripsaw Falls' so that he could enjoy the thrill of dropping 75 ft at 45 mph into a pool of ice cold water. I personally didn't see what all the resulting fuss was about. You didn't die did you? Yes, you thought you were going to die, but you didn't. And sure, you got wet...but you soon dried. That's the thrill of it, right? The roaring T-Rex the height of our house didn't actually eat you; it wasn't real y'know son. And Doctor Octopus didn't actually spike you through your face with one of his bladed tentacles; you just thought he was going to. And no, you didn't fall down the side of a skyscraper to your death. It was just pretend dying. I mean, really? Why the hysterics?? You're 6. Man up!!! And do it quickly or else I've blown 5k on nothing! After the incident on the Ripsaw Water Falls, Jurassic Park and Spiderman rides, my husband and I were confined to the likes of the carousel and other such rides designed for newborns and one year old's to experience the thrill of their lives. And I have to tell you, queuing up for hours with sugared-up, hysterical toddlers who pulled the arms of their stressed parents clean from the sockets was no fun. Enduring the crying, the shouting, the repeated threats of 'Right, that's it!!! I am going to count to ten; 1, 2, 3, " just to sit on a tinky-tonk train for 65 seconds wasn't exactly the thrills that my husband and I expected when we booked this costly trip of a lifetime. But then we discovered the SINGLE RIDERS line!! Yes, created for parents of wimpy kids (us) and those of screaming toddlers (everyone else), this glorious invention gave many of us worn-out parents the opportunity to escape our hysterical kids and have a nice sit down. A moment of peace from the madness, if you will. Sure, we were risking potential paralysis, heart attacks and back spasms, but this was far easier than standing in the Carousel queue with our whingeing nippers. I can't tell you how many lovely parents that I met/squeezed/screamed at/faced death with as we took time out from our irriating families. Being a single rider in this life sure does have its advantages let me tell you. me, Ryan from new york and jane from ohio taking a well needed break. We spent several days and aged several years queuing for kiddie Carousels and decided that we had to try something new before our heads exploded from boredom. 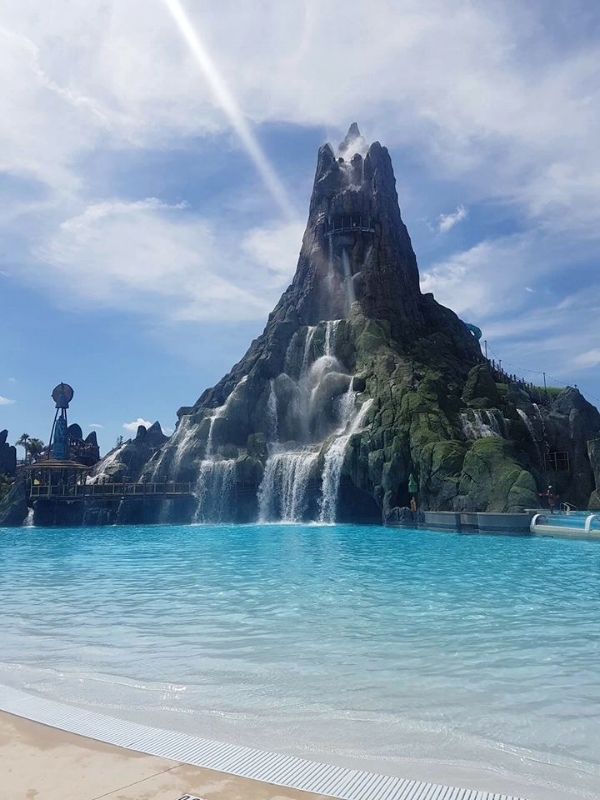 We decided on Volcano Bay; a brand new luxury water park which apparently cost a whopping 600 million quid to build! It sure was impressive! A giant Volcano sat at the heart of the park with a glorious man-made beach surrounded by palm trees. It was paradise and definitely a place that my wimpy kids wouldn't be too afraid to enjoy. We slapped on our lotion, laid out our towels and headed towards the beach to finally enjoy some family fun. A simple stool in a pool was all it took to destroy paradise and potentially put an International company out of business. It turned out that not even 600 million quid can predict the instability of a toddler's bowels. I could have told the park owners this long before they parted with their millions of bucks that's for sure! And I would have told them for free and all. In the end, I abandoned my kids and husband in the kiddie area where the only potential thrill was the possibility of drowning in 1 cm of water or being twatted on the head by an inflatable Peppa Pig ball and I went searching for my own thrills. Yes, I am not ashamed to say it, but the idea struck me when I was queuing for the mighty Krakatau water coaster. Designed for a minimum of two persons to ride together at a time, I queued up alone knowing full well that I didn't have enough people required to go on the ride. "Oh, I wish my kids would come on this", I said at the top of my lungs in the queue " but they are wimps!!! The aren't brave like all of the other wonderful children here. And I really want to go on this. I hope they let me on by myself. All by myself. Alone. With no one to enjoy it with". "Excuse me Mam. But would you like to ride with us? ", he said. "Oh really? That's ever so nice of you. Thank you both so much!!!" Thanks to Jack and Andy from Orlando for being my temporary kids. Thanks also to Rosie and her 6 year old sister from New York and to Brandon and his cousin Harley from Newcastle. It was a pleasure to face death and potential paralysis with you all.